I have been using this delicious matcha green tea powder a lot in my smoothies and tea. 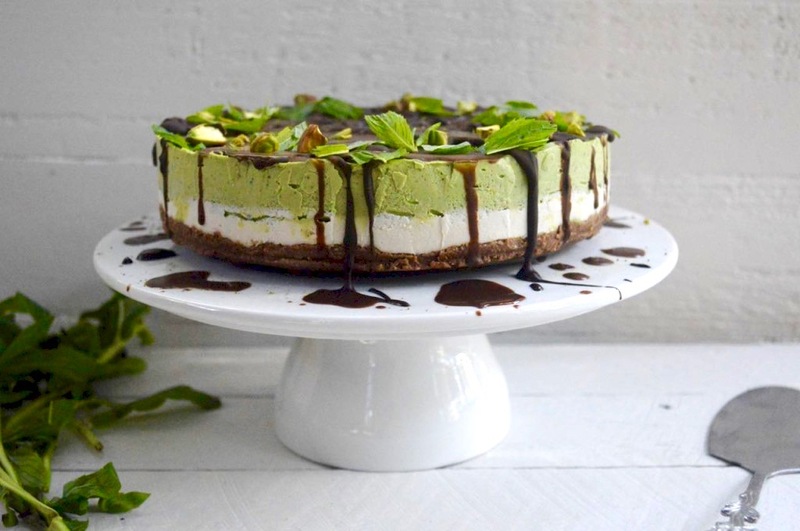 I thought it would be a great idea to incorporate it in a dessert and what better way then a RAW cheesecake! 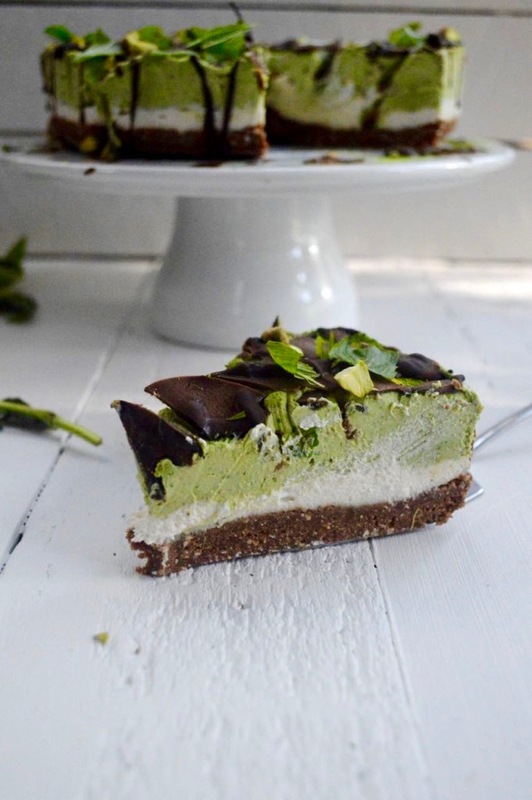 This cheesecake has a refreshing taste of green tea and mint with a hint of chocolate! If you are a green tea lover then you must give this recipe a try! Matcha green tea powder// One of the major health benefits of matcha green tea powder is that it contains high amounts of antioxidants. Antioxidants are naturally occurring chemical compounds that help to prevent anti-aging and chronic disease. Matcha is also rich in insoluble fibers, antioxidants and L-Theanines, protein, calcium, iron and vitamin C! If you are not sure where to buy matcha powder, I have been ordering mine online from kenkotea.com.au. I use Kenko tea mainly because they are a Melbourne based company with great product reviews and their product is 100% USDA Certified Organic, heavy Metal, Pesticide and Radiation Free, raw, 100% Natural, non GMO, vegan Friendly and gluten Free. You will need a spring cake tin and high speed blender or food processor. Line base of cake tin with baking paper. Blend base ingredients and place in cake tin, press down with fingers until even and place in freezer. Blend cashews, coconut oil, vanilla extract, coconut water and sweetener and blend until smooth. Pour in some of the filling in the cake tin and leave the rest for the green tea layer. With remaining cashew filling, add in spinach, mint, peppermint extract and matcha powder, blend until combined and pour into the cake tin. Place in freezer and let it set for about 4 hours. Break up chocolate bar in a heat proof bowl, boil water in a saucepan and place bowl in water. Let the chocolate melt, and grab the bowl with a tea towel so you don't burn your hand and pour onto the cake. Add a sprinkle of matcha powder, mint and pistachio nuts. Store in fridge or freezer! that looks so great!! There are a lot of recipes in line waiting to be cooked ! Delicious!! And what a great pictures! This cake matcha looks beautiful! Love the pictures! This looks spectacular Tiana! Beautiful photography too. this cup of spinach, is it raw or boiled? What a perfect combination and I also love the colour. Look so tasty. Thanks for sharing.